Edward Said died ten years ago in September, and earlier this month Noam Chomsky delivered the 2013 Edward Said Memorial Lecture in London: Violence and dignity: reflections on the Middle East. The text that formed the basis for the lecture is here, and you can watch a video of the lecture here with introductions by Omar Al Qattan and Mariam Said. 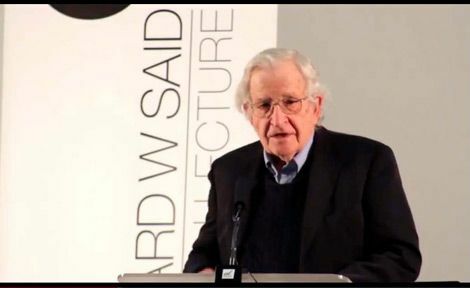 It’s a wide-ranging lecture, but Chomsky returns again and again to the plight of the people of Gaza – and to the disgraceful actions of all those (inside Israel and out) who would rob them of their dignity, their independence and even their life. Throughout these years Gaza has been a showcase for violence of every imaginable kind. The record includes such sadistic and carefully planned atrocities as Operation Cast Lead — “infanticide,” as it was called by the remarkable Norwegian physician Mads Gilbert who worked tirelessly at Gaza’s al-Shifa hospital with his dedicated Palestinian and Norwegian colleagues right through the criminal assault — a fair term, considering the hundreds of children massacred. And from there the violence ranges through just about every kind of cruelty that humans have used their higher mental faculties to devise, up to the pain of exile that Edward Said wrote about so eloquently. This is particularly stark in Gaza, where older people can still look across the border towards the homes a few miles away from which they were driven — or could if they were able to approach the border without being killed. One form of punishment has been to close off the Gaza side of the border area, including almost half the arable land, according to the leading academic scholar of Gaza, Harvard’s Sara Roy. Edward raged against the division of his people and against the kind of loss that such division could bring: disunity, abandonment, irrelevance. In The Origins of Totalitarianism, Arendt argues that the fundamental deprivation of human rights is expressed first and most powerfully in “the deprivation of a place in the world which makes opinions significant and actions effective. Something much more fundamental than freedom and justice… is at stake when belonging to the community into which one is born is no longer a matter of course and not belonging no longer a matter of choice…” “This extremity and nothing else,” she writes, “is the situation of people deprived of human rights. They are deprived not of the right to freedom but of the right to action.” “Over the last 45 years Gaza’s trajectory has been striking; from a territory economically integrated into, and deeply dependent upon, Israel and deeply tied to the West Bank, to an area largely marginalized from Israel and the West Bank, an isolated (and disposable) enclave – subject to consistent military attacks – with which Israel and the West Bank have fewer formal economic or political ties than they once did. And from a captive economy restricted to fluctuating levels of growth (at best) but still possessed of the capacity to produce and innovate (within limitations), to an economy increasingly deprived of that capacity, characterized by unprecedented levels of unemployment and impoverishment, with three-quarters of its population needing humanitarian assistance. These damaging transformations among others I shall discuss are becoming increasingly institutionalized and permanent, shaping a future that is both partial and disfigured. What is happening to Gaza is, in my view, catastrophic; it is also deliberate, considered and purposeful. Her lecture is spell-binding –though I hope that once and for all it breaks the spell of Israel’s ‘withdrawal’ from Gaza. 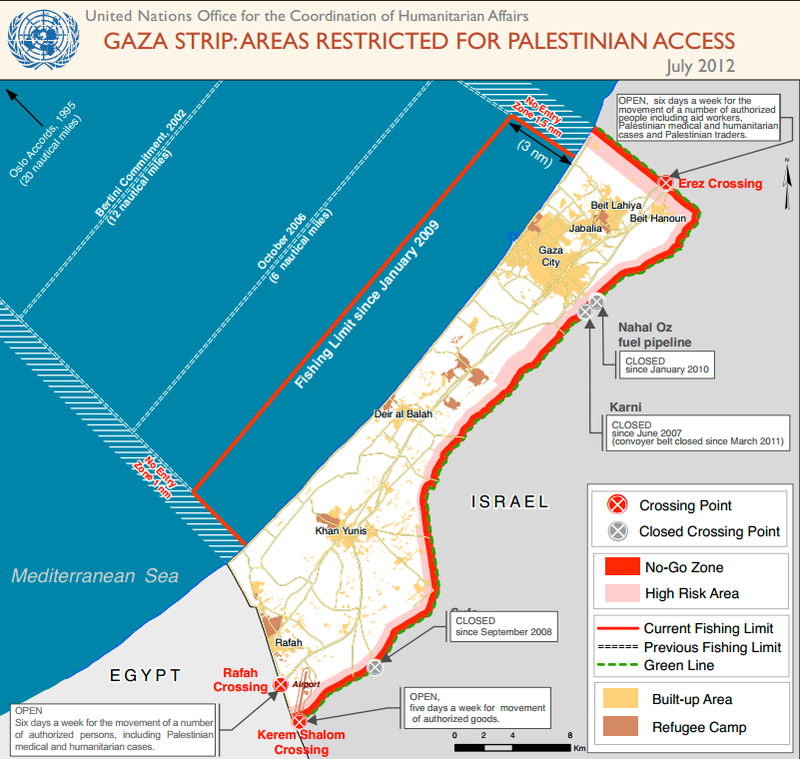 The map above comes from a UN report, Gaza in 2020: a liveable place? that is summarised here, and the text and a video of Sara’s lecture are available here and here. The text will form part of Sara’s introduction to a new edition of The Gaza Strip: the Political Economy of De-development. Marc Ellis provides a wonderful summary of and meditation on Sara’s passionately analytical lecture at Mondoweiss here, and you can access Sara’s A Land Diminished: reflections on Gaza’s landscape (2011) here (it also appears as a chapter in an important collection from the Ibrahim Abu-Lughod Institute of International Studies at Birzeit University, Gaza, Palestine: Out of the margins, which is available here). Jo Long made a parallel, beautifully nuanced argument in her ‘Border Anxiety’ essay in Antipode in 2006, but you can literally see what Laila Shaw means in the extraordinary Cast Lead (2011; above left). I believe the Gaza Graffiti differs completely from urban graffiti that one sees in big cities around the world. In Gaza, graffiti on the wall was the only method available to Palestinians to communicate with each other. The Israeli occupiers banned any form of media in Gaza, such as newspapers, radio, or television. The writing is cursive, spontaneous and hurried. It changed almost daily to update whatever was happening in Gaza. 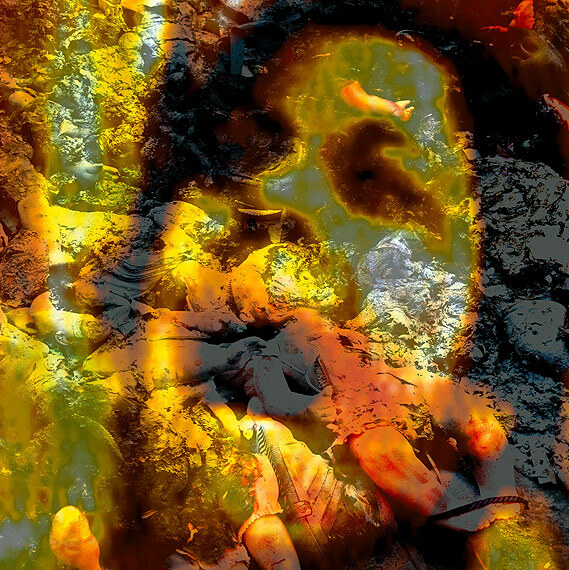 In the Walls cycle she juxtaposed images of Palestinian children and graffiti from Gaza to expose the trauma of war and occupation, a theme to which she returned in Target (2009), a variation on an iconic panel from Walls, in which a photograph of a young child is superimposed against a graffiti-covered wall with a cross-hair centred on his face. ‘War deprives children of their childhood,’ she says. 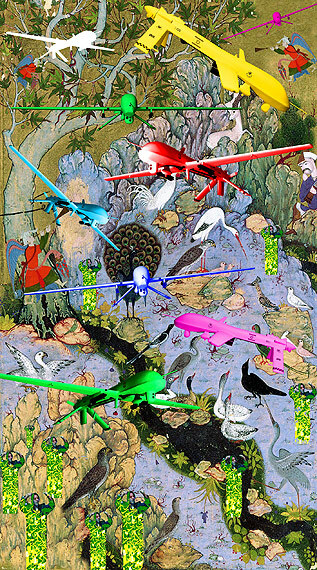 Last year she had an exhibition at London’s October Gallery, The Other Side of Paradise, which was in part provoked by a documentary on a female suicide bomber but which also included the extraordinary images shown below, Birds of Paradise and Gaza Sky, which speak directly to my previous post about other ways of visualizing drones. Where should we go after the last border? Where should the birds fly after the last sky? 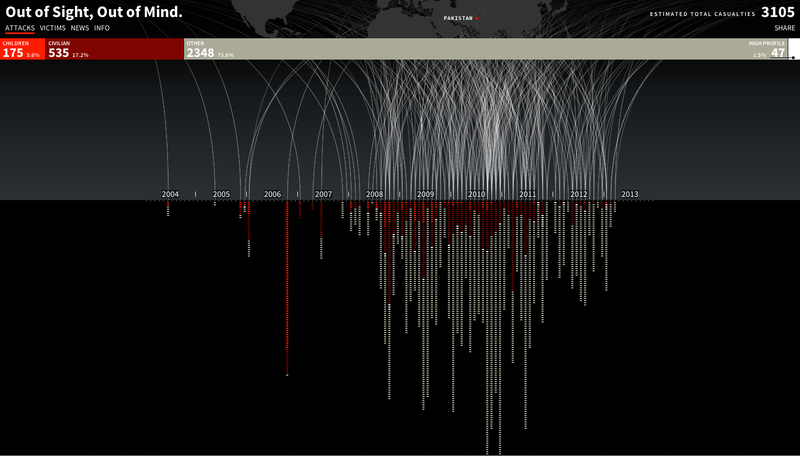 While everyone’s attention this week seems to have been captured by Pitch Interactive’s remarkable graphic of US drone strikes in Pakistan, Out of sight, Out of mind, Elspeth Van Veeren provides a timely reminder that there are other ways to visualise done warfare – all the more important given the central role that visual feeds play in the ‘dwell-detect-destroy’ assemblage. If drones are to be understood and debated, we need to pay attention to the ways in which visual politics plays into these debates. How are drones visualized? 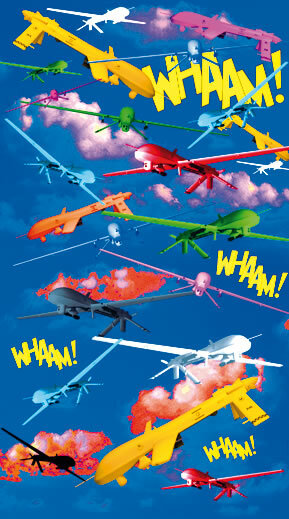 How are the politics of drone warfare made sensible? Drones as things enter into our world through the ways in which they are talked about, but also the way they are represented, repeated and circulated. They become objects and images through which we think. Their different perspectives – drone thing, drone vision, dronestream, and droneshadow – offer different and in some ways competing imaginaries of drones…. Paying closer attention to these visual practices, to the sensible politics of drone warfare, offers a way to think through the many ways in which security and insecurity are produced. 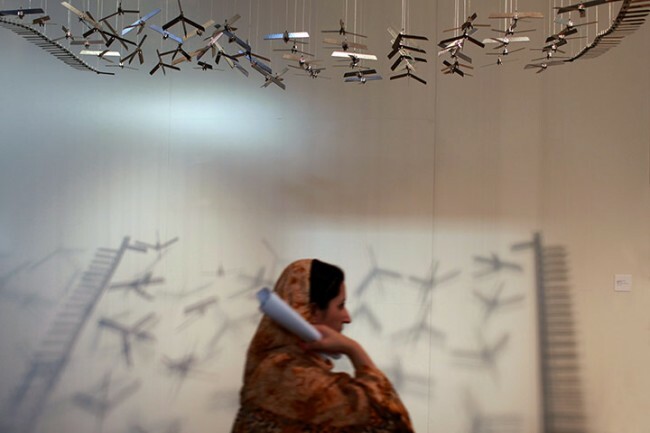 These drone imaginaries make drones visible and sensible, and in so doing they also tune us into the different people and identities that are connected with this technology. Imagining a drone also means imagining a viewpoint and there is more than one way to imagine a drone. You can find other examples here – from which I’ve borrowed the image above – and in Craig Jones‘s post here. Elspeth develops her argument about visualization and politics in depth and detail in a paper she is presenting in a panel on Visualizing insecurity at the ISA Convention in San Francisco next month, ‘Drone imaginaries: There is more than one way to imagine a drone’, and you can download a working draft here (registration required). She also has a book in the works from Routledge, Security collisions. Most of the baubles on offer are decidedly for play in the global North, but for older kids with global (in)sensibilities there’s always this model Predator…. and plenty more like it (for example here and here). Commentary – and comments (you’ll see what I mean) – here and (from Infowars) here. LSA Professor of Anthropology Jason De León has spent long hours in the Sonoran environs, cataloging and collecting the items migrants leave behind as they attempt to cross into the United States. Water jugs. Shoes. 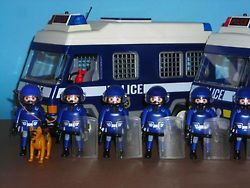 Small kids’ toys. It looks like trash, but these objects, collected through his Undocumented Migrant Project (UMP), become data to help construct a record of people who are unknown, whose journeys rarely come to light. 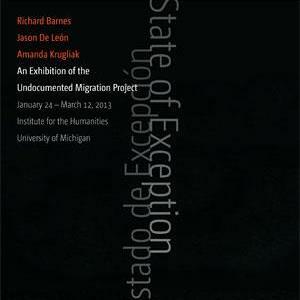 Many of these objects are now on display through LSA’s Institute for the Humanities exhibit titled State of Exception. This exhibit considers the complexity and ambiguity of the found objects and what they may or may not reveal in terms of transition, human experience, culture, violence, and accountability. This is the first major curation of De León’s work since UMP began in 2009, and is a combination of objects, installation, and video shot by photographer Richard Barnes along the U.S./Mexico border. The exhibition closed earlier this month but you can still access the catalogue/brochure online here. 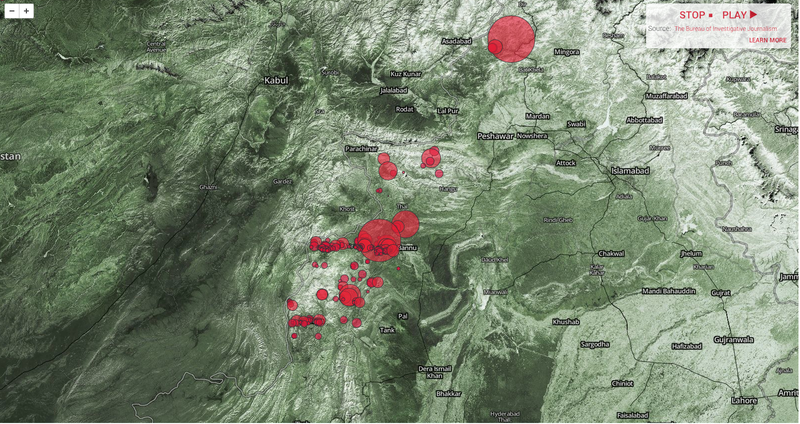 An interesting interview over at the Huffington Post with Wesley Grubbs, one of the visual designers at Berkeley-based Pitch Interactive responsible for the infographic of drone strikes in Pakistan that was released on Monday and has since gone viral. I drew attention to it in my discussion of the geography of those strikes, but that dimension doesn’t appear in this otherwise compelling infographic (screenshot below). The project is called Out of Sight, Out of Mind – which certainly speaks to the politics of drone warfare – but it’s also out of site, and the geography of these strikes, as I tried to show, is not incidental to those politics. The site is live – it will be updated in real time – and the same design group is intent on developing similar visualizations for drone strikes in Yemen and Somalia. The Bureau’s work, the primary basis for the interactive, is so careful and considered that this attempt to downplay and even dismiss Pitch Interactive’s project is either simply ignorant or just plain silly. The author objects that the numbers ‘aren’t exact’ and wants to see the full spreadsheet – but the Bureau has made its detailed databases available and discussed their limitations in depth and detail: what better (‘exact’) sources does she have in mind? Perhaps she should try here. I’m not sure that this is much better. Its author concludes: ‘Put simply, the visualization is implying that of 3,105 drone-strike casualties, only 47 are known to be legitimate kills. This is nonsense.’ Actually, what is nonsense is to misread and mis-represent the infographic in this way; what the website clearly says is that less than 2 per cent of the victims (a total of 47 people) have been ‘high profile targets’ (the original object of Sylvan Magnolia, the code-name for the covert war). What is left out when critical reflection on armed conflict is conducted under the sign of ‘security’? What happens to ‘war’ itself in critical scholarship? What are the forms of contemporary militarism? How can the discourses and practices of fighting, transition to ‘peace’, war preparation and military and strategic thought be engaged reflexively? 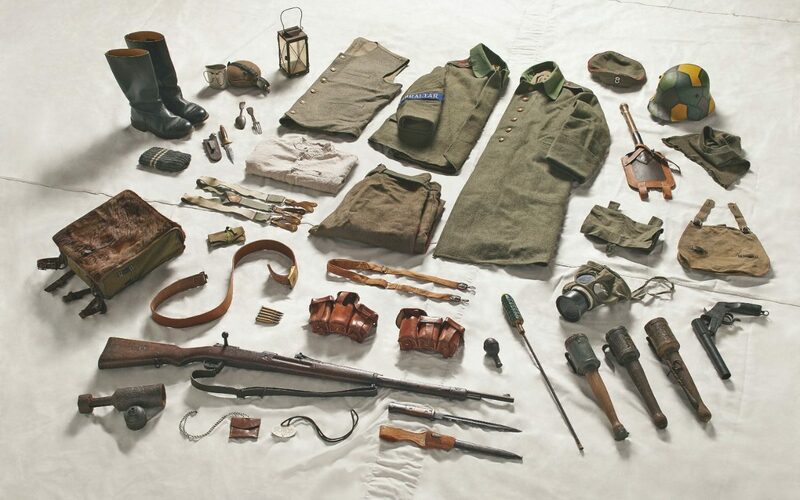 How might militaries be understood as sites of subaltern labour, resistance and critique? 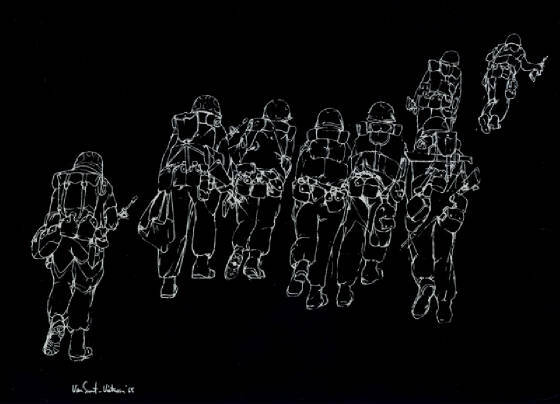 How can attentiveness to experiences of war generate critical resources within international relations, sociology, geography, anthropology, history and other disciplines? Multi-disciplinary proposals – initially an abstract or position statement – are invited for a one–day workshop convened by the University of Sussex Centre for Conflict and Security Research. The organisers welcome contributions engaging the idea of Critical War Studies, the themes outlined above and below, or suggesting other appropriate topics. It is envisaged that this will be the first of several events leading to opportunities for peer-reviewed publication. Critical approaches within strategic theory: who is strategy ‘for’? 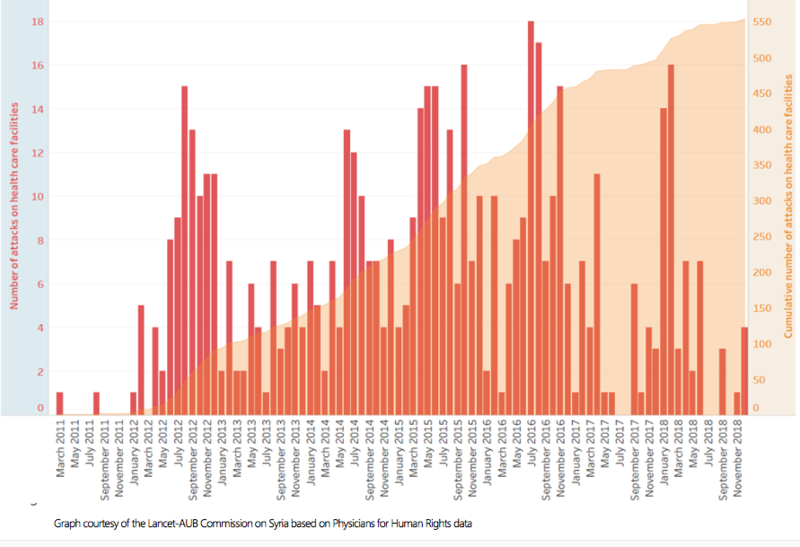 You can see the rapid escalation of strikes in 2009-2010 and their contraction in 2011-2012. 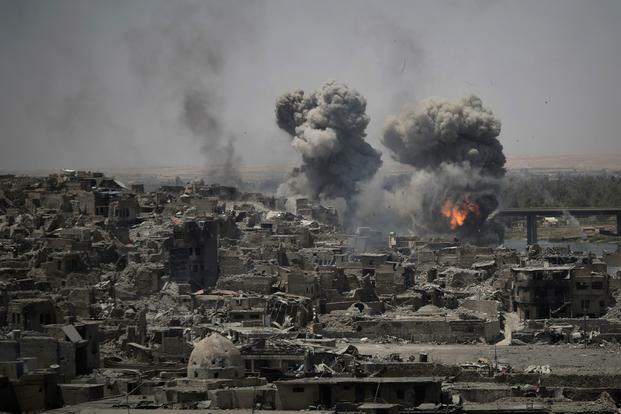 There is also a tendency for later strikes to cause fewer casualties; the Bureau suggests that this may have been the result of a deliberate decision to limit civilian casualties (the CIA was already reported to be using new, smaller missiles with a restricted blast field and minimal shrapnel by the spring of 2010, so the later change is likely to be down to a mix of better intelligence and greater circumspection) and, more recently, of a switch away from ‘signature strikes’ – the two are of course related – and John Brennan, who was one of the main boosters of the programme’s expansion, now claims that drone strikes are a weapon ‘of last resort’. Maybe; most sources agree that even as the numbers of deaths dwindled, so too did their tactical significance. By February 2011 it was clear that fewer and fewer were so-called ‘high-value targets’ and more and more were simply foot-soldiers. What the maps can’t convey is the intricate, inconstant gavotte between Pakistan’s various military campaigns and US air strikes in the borderlands since 2004. 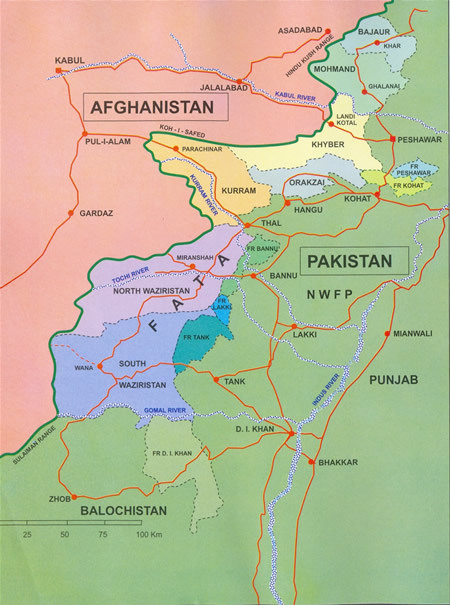 In the wake of 9/11 and the US-led invasion of Afghanistan, and in response to increasing pressure from Washington, the Pakistan Army launched a number of offensives against militants in the Federally Administered Tribal Areas (FATA). In April 2004, after fierce fighting in the mountains of South Waziristan, Islamabad concluded a peace accord with Nek Muhammad, a key militant leader in the agency. But he was killed just two months later, the first casualty of a US drone strike in Pakistan, and the agreement immediately collapsed. In 2005 similar, fragile agreements were negotiated with Baitullah Mehsud, Nek’s successor, and other militant leaders, but these were soon broken. Accords were also signed in North Waziristan in 2006 and 2007 but these too were short-lived. In 2008 a peace accord was signed with the Tehrik-i-Taliban but heavy fighting continued, with major ground and air operations in the agencies to the north of the Khyber Pass. In 2009 Pakistan’s military campaign became even more aggressive. Much of its effort was focused on the northern districts, especially around the Swat Valley, but attention then switched back to South Waziristan. During the summer the Pakistan Air Force carried out regular air strikes in the region; in August 2009 Baitullah Mehsud was killed in a US drone strike. In October 30,000 ground troops entered the region, and US drone strikes in South Waziristan immediately juddered to a (temporary) halt. These operations drove large numbers of militants into Orakzai, which in recent years has been a major target of air strikes by the Pakistan Air Force. The previous paragraph is little more than a caricature of a highly complex and evolving battlespace, but the gavotte I’ve described has been artfully – if intermittently – choreographed by the US and by Pakistan in fraught concert: so much so that Joshua Foust writes of the ‘Islamabad drone dance’. This may surprise some readers; earlier this month Ben Emmerson QC, the UN Special Rapporteur on Counterterrorism and Human Rights, concluded a three-day visit to Pakistan by reaffirming what he described as ‘the position of the government of Pakistan’ that drone strikes in the FATA ‘are a violation of Pakistan’s sovereignty and territorial integrity.’ Emmerson met with officials from the Ministry of Foreign Affairs, the Ministry of Defence and the Secretariat of the FATA – but not, significantly, with anyone from the military or the ISI – who told him that ‘reports of continuing tacit consent by Pakistan to the use of drones on its territory by any other State are false’ and that ‘a thorough search of Government records had revealed no indication of such consent having been given.’ Certainly, the government has repeatedly protested the strikes in public, and the National Assembly passed resolutions in May 2011 and April 2012 condemning them. But Foust insists that Emmerson has been an unwitting participant in the dance. We know, from the Wikileaks cache of diplomatic cables from the US Embassy in Islamabad, that in August 2008 Prime Minister Yousaf Raza Gillani told the Ambassador that he approved of the drone strikes as part of ongoing offensives in the FATA – ‘I don’t care if they do it as long as they get the right people’ – and that ‘We’ll protest it in the National Assembly and then ignore it.’ But this was more than ‘tacit consent’. 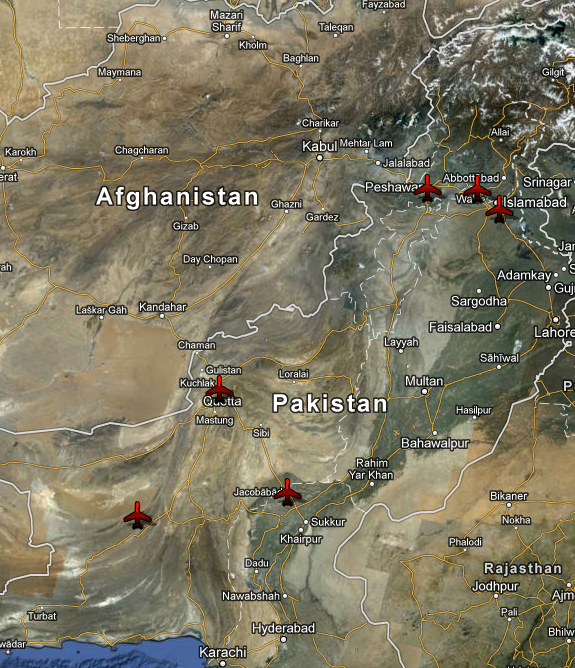 Foust reminds us that, until comparatively recently, US drones were being launched or supported from at least six different air bases inside Pakistan, shown below, including Islamabad, Jacobabad, Peshawar, Quetta and Tarbela Ghazi; the US was ordered to leave Shamsi and had its lease terminated in December 2011. But there’s more. Pakistan had agreed that the focus of the US strikes would be North and South Waziristan. 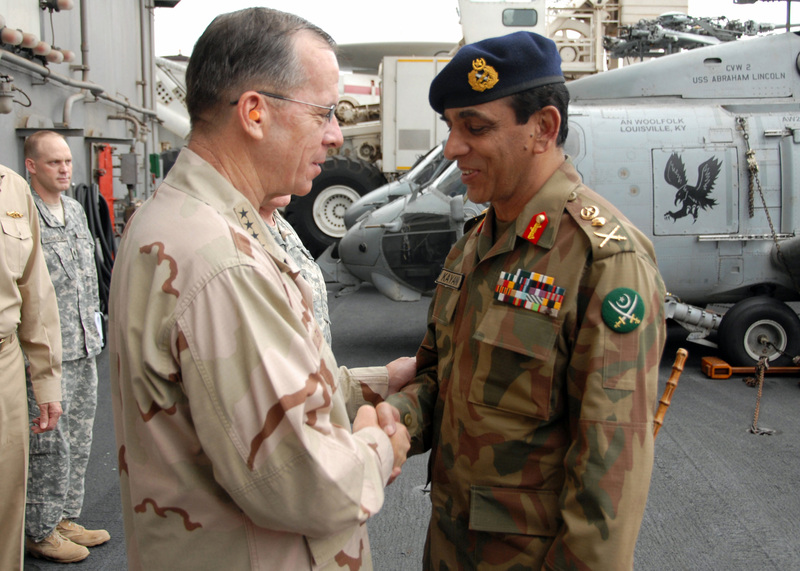 Earlier that same year, March 2008, the Chairman of the Joint Chiefs of Staff Admiral Mullen asked General Kayani, Pakistan’s Chief of Army Staff, for help in approving ‘a third Restricted Operating Zone for US aircraft over the FATA’, and writing in the Washington Post in November 2010 Greg Miller confirmed that these ‘flight boxes’ were confined to North and South Waziristan (although the US had unsuccessfully pressed for permission to extend the flights over Quetta, outside the FATA). The geometry of those boxes is not known, though it would not be difficult to superimpose two likely rectangles over the previous map sequence. Operational details are, not surprisingly, far from clear. 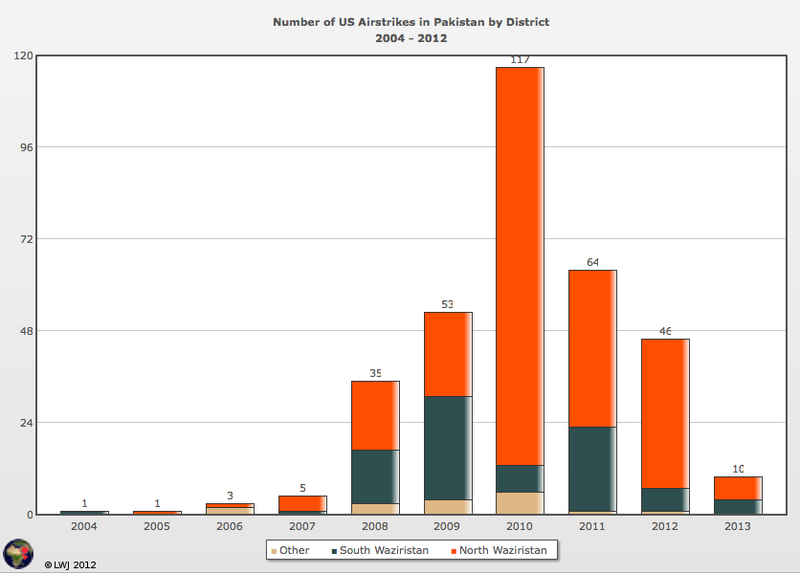 According to a report in the Wall Street Journal on 26 September 2012, the CIA sends a fax to the ISI every month detailing strike zones and intended targets – replies apparently stopped early last year, but the US interprets the silence as ‘tacit consent’ since Pakistan immediately de-conflicts the air space to allow the Predators to carry out their surveillance – and a report in the New York Times earlier this month claimed that the US still provides the Pakistan military with 30 minutes notice of an imminent strike in South Waziristan (but no advance notice for strikes in North Waziristan because the Haqqani Network enjoys such close ties with the ISI that the CIA fears their targets would be warned of the attack). The focus on the FATA follows not only from the militant groups that are based there; it also derives from the exceptional legal status of the borderlands. Under British colonial rule, this was a buffer zone whose inhabitants were allowed a measure of nominal autonomy; colonial power was exercised indirectly through the authority vested in tribal leaders (who received subsidies from the British), and the special Frontier Crimes Regulations – in practice corrupt and draconian – were codified by Lord Curzon in 1901. 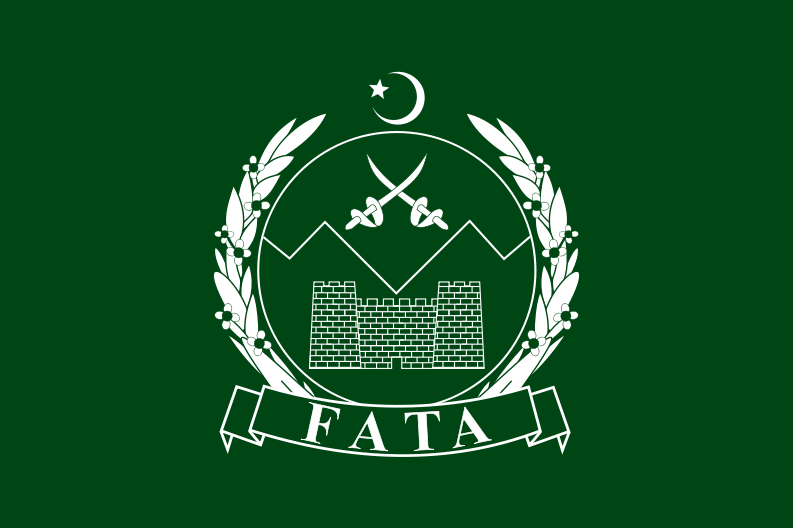 After partition and independence in 1947 Pakistan retained the 1901 Regulations, so that the President – who has direct executive control of the FATA – appoints a Political Agent for each agency who has absolute authority to adjudicate criminal and civil affairs; ordinary Acts of Parliament do not apply to the FATA unless the President expressly declares that they do. Limited reforms were introduced in August 2011, including the right to political mobilisation, but some commentators raised doubts about their implementation. Preventive detention and collective punishment remain in force and the writ of the courts is still severely restricted. 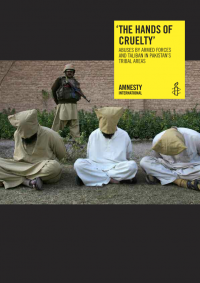 (Given the – I think abusive – attack on Amnesty’s report by Abdullah Mansoor at Global Research as ‘malicious’ and ‘misinformation’ that virtually ignores the violence perpetrated by the Taliban and other militant groups, I should also draw readers’ (and his) attention to Amnesty’s previous report, As if Hell fell on me, which provides a detailed indictment of exactly that). In short, the FATA constitute a space of exception in precisely the sense given to that term by Giorgio Agamben: the normal rights and protections under the law are withdrawn from a section of the population by the law. To see what this has to do with the geography of US drone strikes we can turn to an attack on 19 November 2008 on a residential compound in Indi Khel, 22 miles outside Bannu and about two hours by road from Peshawar. Five alleged militants were killed and four civilians injured: not a large toll compared to other strikes, and yet the public reaction across Pakistan was extraordinary. 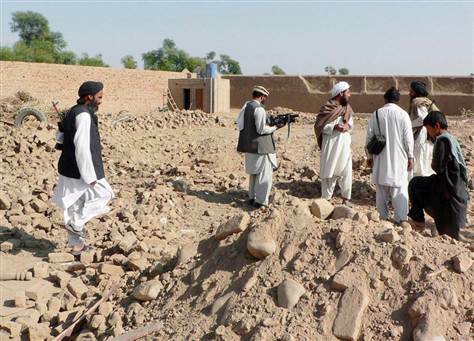 ‘According to local press, the alleged U.S. strike in Bannu on November 19 marked the first such attack in the settled areas of the Northwest Frontier Province, outside of the tribal areas. The strike drew a new round of condemnation by Prime Minister Gilani, coalition political parties, opposition leaders, and the media. The language is truly extraordinary, with its distinction between the FATA and ‘Pakistan proper’, even ‘mainland Pakistan’. In short: (imaginative) geography matters. Not for nothing are the FATA known in Urdu as ilaqa ghair, which means ‘alien’ or ‘foreign’ lands. I will leave a review of these debates, at once legal and political, for another day; among the most relevant recent contributions are Kenneth Anderson, ‘Targeted killing and drone warfare: how we came to debate whether there is a legal geography of war’ (2011), available here; Laurie Blank, ‘Defining the battlefield in contemporary conflict and counterterrorism: understanding the parameters of the zone of combat’, Georgia Journal of International and Comparative Law 39 (1) (2010-11), available here; Jennifer Daskal, ‘The geography of the battlefield: a framework for detention and targeting outside the “hot” conflict zone’ (2012), available here; Noam Lubell and Nathan Derejko, ‘A global battlefield? Drones and the geographical scope of armed conflict’, Journal of International Criminal Justice 11 (1) (2013) 65-88 (abstract here). In this twilight zone, where Washington at once admits its actions through a never-ending string of off-the-record briefings and yet denies any responsibility for their collateral outcomes, there are no inquiries into ‘mistakes’, no culpability for wrong-doing, and no compensation or restitution for the innocent victims. Whatever you make of the rights and wrongs of all this, what matters for my present purposes is that these two legal regimes, one national and the other transnational, work in concert to expose the people of the Federally Administered Tribal Areas to military and paramilitary violence and, ultimately, death. It’s more than a matter of law, of course (and in any case we shouldn’t confuse legality with legitimacy). Within these exceptional spaces there has been active, tactical collaboration between the US and Pakistan. Another diplomatic cable reported a meeting on 22 January 2008 with General Kayani, who asked US Central Command to provide ‘continuous Predator coverage of the conflict area’ in South Waziristan, but was offered only Joint Terminal Attack Controllers to direct PAF air strikes by F-16s – an offer which was refused because of a reluctance to allow US ground forces to operate inside Pakistan. But in September and October 2009 small teams of US Special Forces were deployed to provide intelligence, surveillance and reconnaissance (ISR) support to the Pakistan Army, which included a ‘live downlink of unmanned aerial vehicle (UAV) full motion video.’ (What is interesting about all these exchanges is the degree of collaboration they reveal not only between the US and Pakistan but also between the CIA and the US military, especially Joint Special Operations Command; this is not surprising, given the hybridisation of military and paramilitary violence and the close involvement of the military in supplying, servicing and even flying the drones used in CIA-directed strikes). There have been several reports of continuing collaboration between American and Pakistani intelligence operatives working on the ground in Pakistan, and one source – who purported to run a network of agents and ‘spotters’ in North and South Waziristan – told Reuters in January 2012 that ‘Our working relationship is a bit different from our political relationship. It’s more productive.’ He claimed that the US and Pakistan agreed priority target lists between them, and that it took little more than two or three hours between the location of a targeted individual and the firing of missiles. These claims are impossible to verify, but the emphasis on a working relationship rings true. Here you can see two perspectives on administrative killing, one from Pakistan and the other from the United States, converging onto a single target. The cables from which I’ve quoted are all four or five years old, but this reflects the shutters coming down after the subsequent assault on Wikileaks and the arrest of Bradley Manning – the reports from seasoned investigative journalists are much more recent. I suppose you might conclude that none of them contradicts that artful word that does so much silent work in the official statement repeated by Emmerson, in which Pakistan denies reports of continuing tacit consent. But given what I’ve shown about the deadly dance over those five years, do you really think the music has stopped?